Avani Avittam also known as ‘Upakramam’ is a significant ritual for Brahmin community in Kerala and Tamil Nadu. It is observed on the ‘Shravan Purnima’ (full moon day) of the traditional Hindu calendar, which is the also the day of Raksha Bandhan. The word ‘Avani’ implies the ‘Tamil month’ and ‘Avittam’ is ‘one among the 27 Nakshatras’. Brahmins community in all corners of the world observe the Avani Avittam ritual with full dedication and devotion. The Yajur Vedic Brahmins begin reading Yajur Veda on this day for next six months. On Avani Avittam Brahmins are bestowed with a holy thread and it is believed that the third eye (eye of wisdom) opens up. Avani Avittam is celebrated with immense zeal in Orissa, Maharashtra and southern states of India and is also known as ‘Janeyu Purnima’ or ‘Jandhyala Purnima’. On the day of Avani Avittam a sacred vow or ‘Mahasankalpam’ is taken for compensation of the sins committed in the past year. Sacred mantras are chanted during this time. Brahmins get up at sunrise and take a holy dip. On Avani Avittam Brahmins wear a new sacred thread called as ‘Janeyu’ or ‘Yajnopavit’. It is the most important ritual on Avani Avittam and Vedic mantras are chanted during this time. It is usually a community observance that is performed on the banks of a river or pond. After wearing the new thread or Janeyu, the older one is discarded to signify a new beginning. 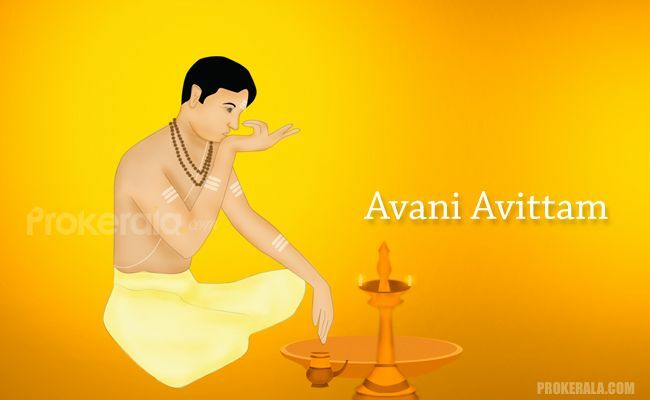 The festival of Avani Avittam signifies a new beginning of learning Veda. In the Hindu mythology, this day is considered very auspicious as Lord Vishnu incarnated as Lord Hayagriva, the God of knowledge, on this day. Lord Hayagriva was the one who reinstated the Vedas to Lord Brahma. This day is also celebrated as ‘Hayagriva Jayanti’. Avani Avittam holds immense importance to Yajur, Sama and Rig Vedic Brahmins. Avani Avittam is also celebrated as the day to express gratitude towards the Rishis for the spiritual knowledge and ancestors for their existence. The day after Avani Avittam is celebrated as ‘Gayatri Japam’. In some regions of southern India, this day is known as ‘Upakarma’.